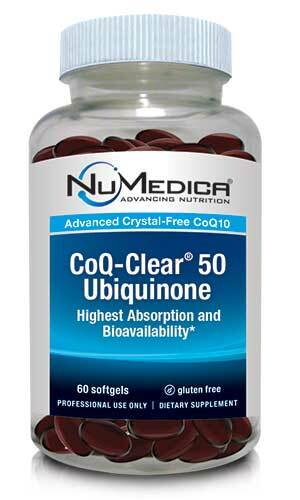 CoQ-Clear 50 mg Ubiquinone (Citrus) - 60 sfgl 1 Softgel 60 Directions: Take one softgel once or twice daily with meals or as directed by your healthcare practitioner. CoQ-Clear 50 mg Ubiquinone (Citrus) - 120 sfgl 1 Softgel 120 Directions: Take one softgel once or twice daily with meals or as directed by your healthcare practitioner. Other Ingredients: Natural food grade citrus oil (GRAS Certified), gelatin (bovine), glycerin, purified water, medium chain triglycerides, natural softgel color (red radish powder, carob extract concentrate, caramel liquid).